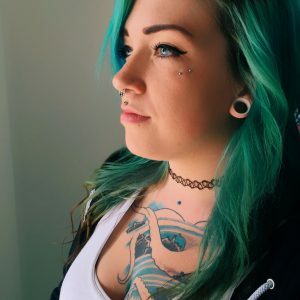 Are you curious about dermal piercings? 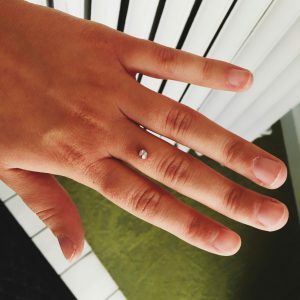 Finding the right Fargo piercing shop that has everything you need will help you make the right decision. Almost Famous Body Piercing is the right shop to take care of you! We also offer dermal piercings at our St. Cloud and Minneapolis locations. A dermal piercing, which is also a surface piercing, is a piece of jewelry that shows a decorative top on the surface of your skin with an anchor sitting beneath the surface of the skin. It is also referred to as single point piercing, with different styles making each one as unique as you want. When getting a dermal, the piercer will first clean the area you wish to get the piercing, mark exactly where you want it, and then the peircer uses a needle to place the anchor. 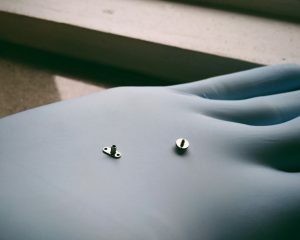 Insertion of the jewelry is done simply using the fingers, or a taper tool. The anchor has a small footed base to help keep it in place beneath the skin. The dermal bottoms we use at Almost Famous Body Piercing have holes in them for the body tissue to grow through and around the base, helping stabilize the jewelry during the healing process and thus more secure after it has fully healed. The exposed piece on the surface of your skin has internal threading, making your jewelry top piece interchangeable. It is highly recommended that you keep the same decorative piece in place until the pierced area has fully healed, and is no longer draining, red, or sore to the touch. Jewelry styles vary by personal preference. We carry a wide variety of colored crystals, and synthetic opal tops as well as some stainless steel options. Finding the right piercer can be difficult in rural areas of North Dakota and Minnesota. Folks searching for Fargo piercing shops should find Almost Famous Body Piercing a great choice. 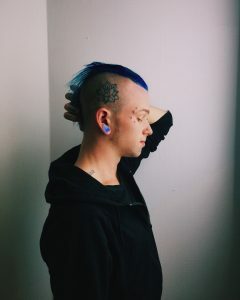 With licensed piercing technicians and a mind blowing variety of initial piercing jewelry to choose from, we are bound to carry something you will wear with pride. Be aware that dermal piercings can reject if not cared for properly. Getting pierced with an anchor with holes in it for the tissue to grow through will lessen the chances of migration, but not make it entirely impossible. 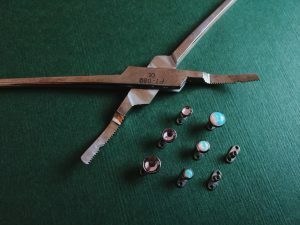 Over time, the body tends to push things that have been inserted into the skin out, like splinters, which is why maintaining and protecting your dermal piercing is key. The healing process varies from person to person, taking between two to three months. Make sure to keep up a regular routine of cleaning and protecting it beyond the healing time will significantly affect whether your body keeps it in place for years or not. In order to help the dermal piercing last, avoid touching it during the healing time unless you are cleaning the area. Avoid using harsh solutions or lotions directly on the pierced area, instead soak the area with a sea salt solution daily, and wash with clear unscented glycerin soap. Saline solution helps to soothe any discomfort while keeping the area hydrated and healing. Adding glycerin soap washes helps to keep the jewelry itself clean and almost residue free. Glycerin also has moisturizing benefits, and is one of the most used moisturizing ingredients in skin care products. Using both in conjunction with proper body hygiene practices will significantly minimize chances of healing difficulties you might encounter otherwise with your piercing. If you do encounter healing difficulties, come back to any Almost Famous Body Piercing location, and we will be happy to help you! It is up to you when it comes to finding what you really want in a dermal piercing. If you are in search of a Fargo piercing shop, then Almost Famous Body Piercing is the place for you.